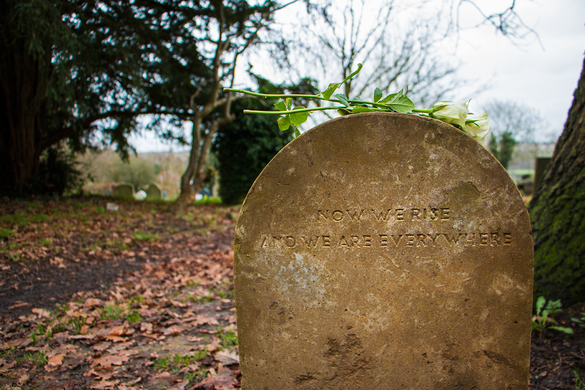 In his lifetime, English singer-songwriter Nick Drake did not see much success for his expressive, emotionally raw music, but his gentle tunes eventually grew in popularity, making his gravesite a place of pilgrimage for fans. Not much is known of the end of Nick Drake’s life other than he had moved back in with his parents, retreating from a seemingly uncaring audience. A life long depression sufferer, Drake eventually overdosed on anti-depressants in 1974. Although there is no evidence that his death was a suicide, it is widely accepted to be the case given the nature of his illness. Drake was buried in a plot beneath an oak tree, along with his mother and father, and all three share a simple headstone with an epitaph taken from the final song on his final album stating, “Now we rise / And we are everywhere.” This hopeful verse on his spare gravestone is a fitting reflection of the man’s whispered music and short life. Now the final resting place of prominent artists and musicians, it was originally founded to separate the rich from the poor in death. A vast necropolis where you'll find the elaborate mausoleums of Argentinian tango stars.